I am beginning to wonder if Davis Bunn is a genius. His books have always been excellent but this book is quite brilliant. The science, in particular quantum computing, is so far over my head it is pitiful. I don't skim through books in order to review them quickly. I enjoy reading a book and I want to make sure that I understand the nuances; to truly enjoy the story. In order to do so with Trial Run it has taken me longer than normal to read. I reread several sections in order to completely understand what was occurring. It had nothing negative to do with the writing, quite the opposite, it had everything to do with the excellence of the writing. I had to back up to make sure that I truly understood the science and its implications. Trial Run was so interesting that I didn't want to just half understand any of it. Davis Bunn a.k.a. Thomas Locke is an author that you should definitely pick up. You will want to read a large sampling of his work. I honestly and without reservation recommend this book to one and all. It is a thoroughly engaging story. It is complex in a very good way. The characters are so real and fascinating. 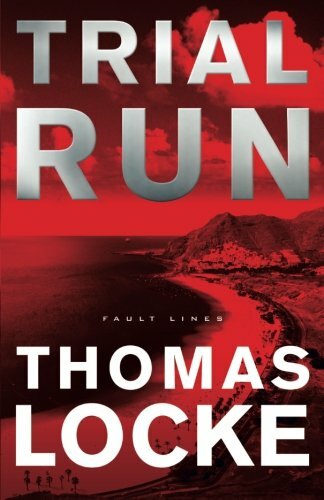 Trial Run is the first book in the Fault Line Series. The author also has a free prequel called Double Edge that you can read while waiting for the second book. I’m headed there. I know that I gush a bit about this author; it’s all because I have been reading him since I was a teen and he is one of my all-time favorite authors. I can tell you that in no way, shape, or form was my gushiness due to any promises or payment on the part of the author or his publisher. I actually won the paperback version of this book in a contest on Thomas Locke’s website which made me a bit giddy.